This popular Roman Catholic Church sits on the corner of Kilbourn and Broadway. It was the proto-German church of the Archdiocese of Milwaukee. Founded by the St. Ann’s Frauenverein, a group of German-speaking women, property for the church was purchased for $425 and a cornerstone laid on April 19, 1846. 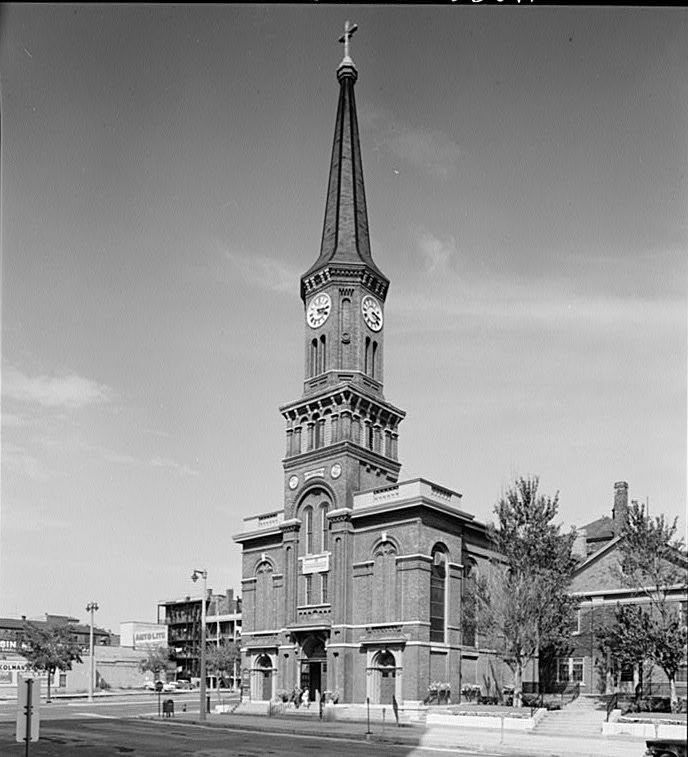 A spire was added to the church in 1866, church bells hung in 1868, and the church’s elaborate interior décor was completed in 1878. The church retained its German character until the early twentieth century. It resisted efforts to relocate it away from the encroaching business district. A rectory was added in the 1920s. The church became a beloved site for daily Mass and devotions for local workers, and was christened “Old” St. Mary. A small influx of Cuban emigres led the local priests to install a small statue of the Cuban Madonna, Our Lady of Charity, in the church. Exterior art work added to the church played off of its urban-impacted location. A large statue of Mary, christened “Our Lady of the Motorists,” was installed in the 1970s. More recently, the church has been added to the National Register of Historic Places, forcing efforts to upgrade and improve the building to follow strict guidelines. As a result, the exterior remains much the same. ^ Steven M. Avella, In the Richness of the Earth: A History of the Archdiocese of Milwaukee, 1843-1958 (Milwaukee, WI: Marquette University Press, 2002), pp. 63, 64, 68, 69, 71, 72, and 106. Avella, Steven M. In the Richness of the Earth: A History of the Archdiocese of Milwaukee, 1843-1958. Milwaukee, WI: Marquette University Press, 2002.